A new graduate heading into a job interview could have an impeccable resume, yet they fail to secure the position because they did not interview well. Similarly, a new grad with a less substantial resume could crush the interview because they had the soft skills necessary to connect with their interviewers. As an entry-level applicant, you can have all the hard skills necessary to fit the job description, but your soft skills are really going to sell you as a perfect addition to the team. 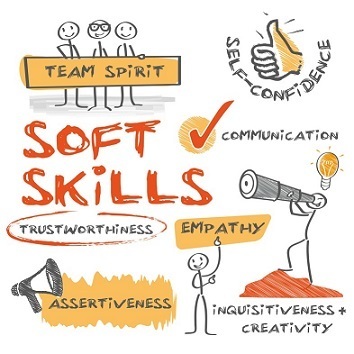 Here are a few soft skills that you should develop to ensure that you walk into your next interview confident, prepared, and ready to prove yourself. Although it won’t make or break your interview entirely, a great first impression will certainly set you up for success. Make sure you have a firm handshake and make eye contact with the interviewers as you introduce yourself (and if you need to practice this, your career center can help). Additionally, if you know the names of each person you are interviewing with, you should try to address them in that manner because it shows that you came prepared and allows you to make a genuine connection from the start. Slouching in your chair, crossing your arms, frowning as you listen, and making little eye contact are all signs that you are closed off, disengaged, and simply not putting your full effort into the conversation at hand. In contrast, when you sit upright in your chair, nod your head while listening, have your hands resting in your lap or on the table, and make appropriate eye contact, you communicate to the interviewer that you are care about what they have to say. Employers need individuals who are ready to listen and learn from them, so this is a crucial step towards getting hired. When asked a question, don’t feel the need to provide an immediate answer- be sure to evaluate what is being asked and take a moment to formulate a response. If you begin speaking right away, your intended message could become unclear and lead you to ramble by the end of it all. Try to avoid using “like,” “um,” and other filler words as well. If you stay composed and take your time when responding, you will show that what you have to say matters. What makes you the perfect candidate for the position you are applying to? Be sure to convey that message to the hiring manager in a convincing way. Don’t just tell them you are good at managing time, but provide them with examples that prove you possess such a skill. As said before, your resume could paint a perfect picture, but your ability to sell yourself as a candidate is what’s really going to secure the position. If you genuinely cannot answer a question or lack a specific skill, your best bet is to be honest. Lying about your experience with Excel, for example, could cause you a world of problems if you actually acquire the position and can’t use the software to complete a simple task on your first day. If you focus on your strong points and your willingness to learn, the interviewers will typically be able to look past the one or two shortcomings that they identify. Looking to start interviewing for entry-level sales positions? Barton Associates is hiring in all ten of our offices nationwide! Check out our website to learn more information and get in contact with a recruiter.